We need to highlight and get people of Dublin involved - this is a Dublin incinerator that will affect whole of Dublin and Ireland. The Minister for Environment Alan Kelly can stop this incinerator if he gives the power back to Dublin City Councillors to make decisions about waste management. Well over 60 people attended the meeting with local residents from Ringsend, Irishtown and Sandymount joined with residents from Fairview and Marino and local politicians. The meeting was very clear the local community is determined to use people power to stop the incinerator going ahead A legal challenge is being mounted to try and stop the incinerator - this includes finding discrepancies between what the planning permission was granted by An Bord Pleanala and the EPA includes and what the contract is for now e.g. changing from 25 to 45 years and now including waste from all over Ireland and not just Dublin. 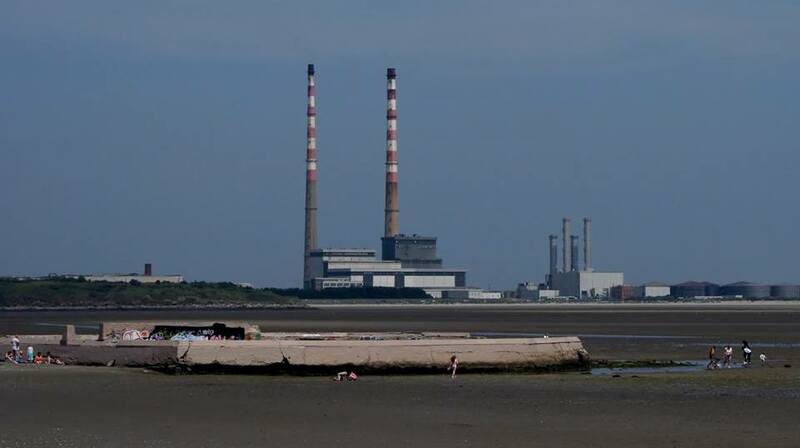 Stop the build of a 600,000 ton Toxic Waste Incinerator in Dublin Bays Poolbeg. Due to start in two weeks time. Your health depends on it! The unelected Dublin City Council executive management have announced that they have given the private multinational Covanta the permission to start construction on the 600,000 tonne Poolbeg/Dublin Incinerator which will be located at the heart of the beautiful Dublin Bay in Dublin's South Inner City. The Council signed a 45 year contract which will see Covanta make hundreds of millions in profit while the health of Dublin people is destroyed. The local community has campaigned for almost 10 years against this toxic incinerator. If the incinerator (which will be the largest in Europe) goes ahead it will destroy their health (and those of all Dublin), clog the roads with traffic, damage the climate, reverse recycling rates, and result in toxic ash being transported around Dublin and Ireland. The elected representatives of the Dublin people - the Dublin city councillors - recently voted 50 to 2 against the decision of City Council Manager to go ahead with the contract with Covanta. This incinerator is anti-health, anti-climate and anti-democratic. Construction is only weeks away from starting on site. 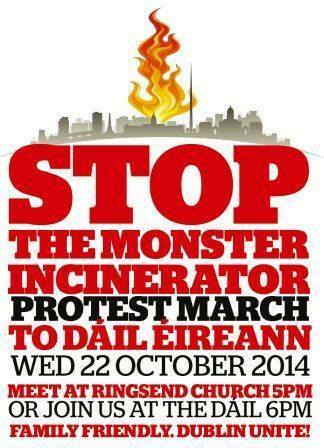 We need people power from across Dublin, Ireland and international to stop this incinerator gong ahead. If the councillors are given back the powers over waste management by the Minister for Environment then they can vote to stop the Poolbeg/Dublin Incinerator. Please sign the petition calling on the Minister for Environment, Alan Kelly to transfer responsibility for decision making waste management away from the unelected City council executive and back to democratically elected councillors in Dublin City Council so they can stop the Poolbeg/Dublin toxic incinerator. CRAI is also raising funds for their public court case against this. Here are the account details if you can donate even 1 euro to help fight the cause on a legal front. Beware of a lot of things! From experience, would urge extreme wariness towards a whole lot people, organisations etc. I'm thinking particularly of An Taisce and what they did in their last Judicial Review (JR) of part of the Shell/Corrib project. There was money collected, both locally in Erris, and nationally, to fund the JR; An Taisce's subsequent behaviour was, I believe, nothing short of disgraceful - the JR was 'settled' with the state for what amounted to a mess of potage. I can be contacted by phone if anybody wishes - 087 959 1474. Im absolutely horrified and appalled that this rubbish burning incinerator is going ahead,im also disgusted that enda kenny was invited to a do a climate change speech,the man is such a hypocrite. I will be donating 50 euros next week for this into your account,this is an absolute disgrace and it needs some credible opposition..
As far as I know, and although I'm not a lawyer, now that the Republic of Ireland has ratified this UN Treaty, the Government of the Republic of Ireland can be brought before the appropriate law courts if they violate it. 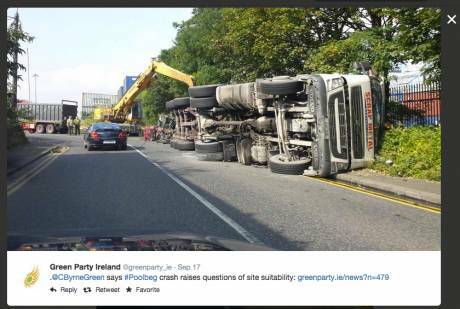 This is not just a dublin problem,these fumes/toxic smoke can blow all over ireland,wherever the wind takes it...And who asks for a 45 year contract and gets it anyway? A smoker has a choice if he/she wants to wreck her/his lungs,what choice do we have in breathing in these toxic fumes? Its a public nusiance and also endangers the heatlh of the population around dublin and beyond.. The nature of these companies are very secretive,look at any plastic manufacturing company they are shrouded in secrecy. What we don't realise with these companies is that plastic by products graunels are added to exfoliators and toothpastes,im only going to brush with natural eco friendly powder toothpastes with no plastics in them. Imagine injesting the plastics from your toothpaste,how many times have people accidently swallowed some of their toothpastes? There is so much plastic added to everyday things we don't realise. The minister for the enviornment should be throughlly ashamed of himself,letting rubbish burning facility for this go ahead and standing idly by,it is clear he is not doing his job! He should be fired asap. "Viniczay added that the committee's decision could prevent Austria from approving the incinerator, which is seen as an environmental and health hazard for Hungarian towns just across the border." "Austria has discriminated against Szentgotthard by denying the town an opportunity to lodge an appeal against its decision. This is why the town has decided to approach the UN's Compliance Committee of the Aarhus Convention in connection with the Heiligenkreuz project, the mayor said." "The Aarhus Convention was signed in 1998 (by the Republic of Ireland as well) to ensure an opportunity for all affected parties to participate in procedures concerning projects of a significant environmental impact." Assuming they ever get to hear of the plans for the Poolbeg Incinerator, and allowing for the prevailing "winds from the west that blow across the seas to Ireland", I wonder how "the people" of places such as Holyhead, Liverpool, Manchester, Sheffield, Leeds (and surrounds), for example, would take to the idea of being saddled with regular doses of airborne "Poolbeg Dioxins, PCBs, and Heavy Metals" for the coming 40 years or so: whether they like it or not? Of course when the wind is from the Eastern, the Southern, and the Northern directions, it's "the people" of Ireland who will be saddled with the "toxic" set of airborne problems in question: whether they like it or not, and assuming that this particular project ever comes to fruition, that is. "Incinerators, Dioxins, PCBs, and Heavy Metals, Health Hazards ..."
"Health Effects of Waste Incinerators"
"Incineration does not destroy waste – it merely converts it to other forms, such as: stack gases, minute dust particles, and ash. All these contain pollutants that are harmful to our health. Emissions from incinerators include: dioxins, PCBs, heavy metals (lead, arsenic, cadmium, etc.). All of these are persistent, bio- accumulative and toxic. Dioxins and PCBs are toxic chemicals that can have severe health effects, especially on the developing foetus and young children. Known health effects include: cancer, impairment of the immune, hormonal, and reproductive systems, congenital abnormalities, delayed cognitive and motor development in children, disruption of critical stages of embryonic development. (Source: WHO and International Agency for Research on Cancer). But by far the greatest risk of exposure to dioxin is through the food we eat. Dioxin from incinerator emissions settles on vegetation, in soil, and in the oceans, and so enters the food chain." 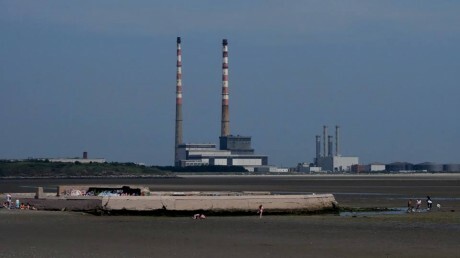 The planned Poolbeg Incinerator, in the Dublin Harbour area, seems to be ideally located for spewing toxins of the types referred to above into the Irish Sea; and, allowing for the highly dynamic ways in which sea currents operate, it appears reasonable to assume that a significant proportion of these toxins would have no little or no difficulty at all probably in making their way from the Irish Sea out into the Atlantic Ocean: and thus into the "marine food-chain" of both the Irish Sea, and the Atlantic Ocean? With this coming Wednesday's (November 5th 2014) High Court "Aarhus Convention Treaty" challenges in mind, the main reason I'm now sending you the information in the section below is because I have in recent weeks come across a few bits and pieces of "www text" (by accident while looking for something else) which has strongly suggested to me that the "Waste Management" legislation being used -- JUST NOW APPARENTLY -- to try to RAM THROUGH the "Poolbeg Incinerator Project (in the Dublin Harbour Area)", is almost certainly the exact same, or very similar, to that which was the subject of the failed "An Bord Pleanala Appeal" I sent through the registered post on February 21st 2004 (Bord Pleanala Reference Numbers: PL 07.205181 and P.A.Reg.Ref: 02/3811). Also, and as Brendan will no doubt confirm, we both sat through the entire An Board Pleanala "oral hearing" which followed, which was held in an Oranmore Hotel (near Galway City), and which lasted for several days. More information relating to this potentially "extremely serious" matter can be found below. "As I mentioned to four local politicians at the end of an Anti-Dump Meeting in Kilconnell on December 8th 2003, I have long believed that Waste Management (Amendment) Act 2001 is in breach of Article 28A of the written Constitution of the Republic of Ireland. This is because of the fact that it completely removes all power from the democratically elected local government politicians regarding important local community matters connected with the location of huge rubbish dumps (e.g. those now planned for Kilconnell and New Inn), and instead places it entirely in the hands of UNELECTED County Council managers." "I also e-mailed all of the Galway TDs regarding this matter on December 17th 2003. In response, I received an e-mail from Minister Eamon O'Cuiv T.D. dated December 23rd 2003 stating that as Article 28A (and the closely related Aarhus Convention Agreement) "comes under the remit" of Minister for Justice Michael McDowell T.D., he had forwarded my e-mail to him for "direct reply" to me. To date, I have heard nothing at all from Minister McDowell." "As I trust Board Pleanala will understand, the fact that the politicians concerned appear unable to answer me suggests that there really is something VERY seriously wrong regarding the constitutionality of Waste Management (Amendment) Act 2001." A final point relating to the "United Nations Aarhus Convention Treaty" is that I have also come across what I believe is good quality legal information which very strongly suggests (to me at least) that, under international law, once any country "signs up" to such a treaty, they immediately -- from that MOMENT onwards -- become legally obliged to NOT do anything which would UNDERMINE it. Sadly, and almost unbelievably (as I see things), all that the entire membership, of all of the three main branches (Executive, Legislative, and Judicial) of the Republic of Ireland governments have been doing up to now, since, that is, the government -- of the time -- signed the "United Nations Aarhus Convention Treaty" in 1998, is to make smithereens out of it; and, which the entire membership of the present Republic of Ireland Government (Executive, Legislative, and Judicial), without a SINGLE exception as far as I know, is STILL doing: well over 16 years later. "Making smithereens of the Aarhus Convention Agreement, Human Rights Ireland ..."
How can Irish law take precedence over international law? Personally, I can't help feeling the "the 10" would do well to get the advice (in writing) of an international lawyer or law-firm before they go any further; and, if necessary to ask to have tomorrow's hearing postponed until they have found such a lawyer (or law firm) to advise them. "Sadly, and almost unbelievably (as I see things), all that the entire membership, of all of the three main branches (Executive, Legislative, and Judicial) of the Republic of Ireland governments have been doing up to now, since, that is, the government -- of the time -- signed the "United Nations Aarhus Convention Treaty" in 1998, is to make smithereens out of it; and, which the entire membership of the present Republic of Ireland Government (Executive, Legislative, and Judicial), without a SINGLE exception as far as I know, is STILL doing: well over 16 years later." And, all because the Republic of Ireland legal profession has been VERY SUCCESSFULLY fooling "the people" of the Republic of Ireland for the past 16 years or so regarding their legal rights under "Aarhus"? All things considered, it appears to me that -- one way and another -- there might be a LOT AT STAKE here for "the people" of the Republic of Ireland? "Environmental (Miscellaneous Provisions) Act 2011"
"DONE AT AARHUS, DENMARK ON 25 JUNE 1998 ..."
"AN ACT TO AMEND AND EXTEND THE AIR POLLUTION ACT 1987; THE ENVIRONMENTAL PROTECTION AGENCY ACT 1992; THE WASTE MANAGEMENT ACT 1996; AND THE FREEDOM OF INFORMATION ACT 1997; TO MAKE PROVISION FOR COSTS OF CERTAIN PROCEEDINGS; TO GIVE EFFECT TO CERTAIN ARTICLES OF THE CONVENTION ON ACCESS TO INFORMATION, PUBLIC PARTICIPATION IN DECISION-MAKING AND ACCESS TO JUSTICE IN ENVIRONMENTAL MATTERS DONE AT AARHUS, DENMARK ON 25 JUNE 1998 AND FOR JUDICIAL NOTICE TO BE TAKEN OF THE CONVENTION; TO AMEND THE PLANNING AND DEVELOPMENT ACT 2000; THE LOCAL GOVERNMENT ACT 1998; THE LOCAL GOVERNMENT ACT 2001 AND THE OFFICIAL LANGUAGES ACT 2003; AND TO PROVIDE FOR RELATED MATTERS." As might be expected, taking into account the way things appear to have been done (up to now) regarding the planned Poolbeg Incinerator Project, the content of the audio report referred to in the paragraph just above suggests (to me at least) that there are MASSIVE PRACTICAL FAILINGS on the part of the Republic of Ireland Government (Executive, Legislative, and Judicial) to uphold the principles of the international United Nations Aarhus Convention Treaty, which it signed up for in 1998, and ratified in 2012. It seems our Government (Executive, Legislative, and Judicial) "can talk the talk, but can't walk the walk", regarding this EXCEPTIONALLY important "human rights" UN treaty? Similarly of course with regard to "Irish Water", The "Rossport Situation" (Shell Oil), certain "Coillte Projects" (I understand), the Celtic Waste/Greenstar Rubbish Dump in Kilconnell, Fracking Plans/Liciences, and so on. The text in the section below, which is believed to be self-explanatory, has come from a FACEBOOK message published this morning. Many thanks for this information, and all of your ongoing efforts. I feel sure that many people all around the world will be deeply appreciative of what you are doing by way of trying to correct the way that all of the potential benefits of the "United Nations Aarhus Convention Treaty" have -- so far -- "failed to register" here in the Republic of Ireland. I personally have long believed that, years ago, "Aarhus" should have been embedded -- "lock, stock, and barrel" -- as an "Amendment" into Bunreacht na hEireann (the Constitution of the Republic of Ireland), especially when it is the case that there is little (or possibly nothing) in Bunreacht na hEireann that relates directly to the important matter of the protection of the environment. "Is é Dia an fhírinne agus saorfaidh an fhírinne muid." "God is truth, and the truth will free us from the falsehoods which have entrapped us." A United Nations "Aarhus Treaty" related e-mail was sent last Thursday (November 13th 2014) to Republic of Ireland Chief Justice Susan Denham. Titled "Government Crime, Government Criminals, and Government Impunity", last Thursday's e-mail was also copied to Republic of Ireland Prime Minister Enda Kenny TD, and to Republic of Ireland President Dr Michael D Higgins.